This short documentary set in the early 1990's discusses the impact the border has had on the towns of Lifford and Strabane since its creation. The programme features numerous guests, including former Customs Officer John Paul Giblin and local politician Paddy Harte. A full transcript can be found by clicking here. Margaret Giblin from the Lifford History Links Group talks about smuggling between Lifford and Strabane in this Radio Foyle Broadcast. Many thanks to Margaret and Treasa Giblin for giving us permission to upload the tapes. Click on the player below to hear Margaret. A full transcription for the show can be found by clicking here. We were very fortunate one evening to have the opportunity to record the memories of Billy Mc Kinley from Ballylawn, Co. Donegal. A member of the Raymochy Historical Society and also the Raymochy History Links Project Group, Billy begins the recording with the detailed research he has carried out into his own family history before talking about his own life, after which the recording becomes even more interesting! The recording was carried out by members of the Raymochy History Links Project Group. Billy also brought in slides which we were able to convert to digital format. Scroll further down the post and have a look! Enjoy and don't forget to leave comments. You can follow the full transcript here. Leonard Roarty from the Raymochy Historical Society and Raymochy History Links Project Group kindly offered to share his memories and family history with the Raymochy group one evening. Leonard's keen interest in history and his in-depth research into his own family history is very detailed and should offer inspiration for anyone wishing to research their own family history. Enjoy and don't forget to leave comments! (Note) A full transcription will be added soon. Let me introduce myself. My name is Collette Molloy. I am a present member of the Strabane and District Caring Services. I am married to John. We have six grown up children and six grandchildren. Prior to this I was Collette Bonner, the second youngest of nine children. Born to Bridget and John Bonner. Our family home was on Knockmillar Road, Douglas Bridge, Strabane. My childhood memories are of endless happy days, spent playing with family members - four sisters and four brothers. There would also be chores to carry out. These included feeding poultry and fetching water from the well, running into the village of Douglas for messages from the local shops. One of the shops was owned by Johnny McNamee, the other by Alan McDowell, who also ran the post office. School was also to feature in my weekly diary. My brothers and sisters would take me to the old school situated on the Ardstraw Road outside of Victoria Bridge. I then moved to the new school which is celebrating its fiftieth anniversary this month (September 2010). The journey to school seemed like an eternity for a five year old as there were no school buses in those days. The only mode of transport was 'Shanks Mare' as the old saying went. To those who do not comprehend this statement, the answer is 'walk'. I grew up in a rural farming community, my father was a farm labourer who was employed by the local farmers. His duties included planting crops of wheat, corn and potatoes, feeding animals, tending the threshing mill etc. In the summer evenings he would cut turf, sow potatoes and veg and cut blocks of wood so that our family was well provided for. He was a hard working man who always put his family first. In the evenings neighbors would call around as our home was a ceili house where everyone was welcome. Names that spring to mind were Sammy Glenn and his brother Willie. The McDaid brothers who were uncles of my dads. Cards and darts would be played and even a good old ghost story would be told. My mother was the provider of food and drink, home made scones and big mugs of tea. She made everyone happy. The visitors would say goodnight, the fire was doused, lights from the gas lamp turned off and the doors locked. These are some of the beautiful memories I have from long ago. Sadly the voices of my mother and father are silent now, as well as my brothers like most of those who have come and went to our little home. They have passed on to their eternal reward but the sweet memories of that by-gone age remain in my heart. The old factory I am writing about is where I live in Victoria Bridge. It still stands but is derelict. It used to be a glass factory and once it was a box factory. I think it was also once a railway station and also a Nestlé factory. There was lots of things in this factory. I will be finding out a lot more about this factory, no one ever says anything about this place as its in Victoria Bridge, but in the past few years Victoria Bridge has expanded. My family has been in Victoria for 25 years or over. Anyway this factory has a lot of past in it and is part of social history because this is where people worked and met and it is industrial history because of the building. I am interested in finding out about local history. I recently saw a history project done on a walkway known as the Bridle Path (by Raphoe History Links Group), This caught my attention. I thought it would be cool to see if Strabane and surrounding areas has something like this to do. It could be interesting doing a walkway because you have to get out and about to find an old walkway, then you have to find out how long it was in use, what grew along the pathway, if there was any wildlife along the walkway and who used it. We could have the opportunity to repair the walkway and bring it back to life, but to make it wheelchair friendly spoiling the natural beauty of the pathway. Doing a project like this means I will be mixing different kinds of history and bringing them together. Social: Because people may have used the walkway in the past either by foot or by horseback. Natural: Due to the flowers and the trees that might have grown there and the wildlife that you might have seen along the walkway. Architectural: The opportunity to repair and rebuild the walkway. Bringing it back to its natural beauty and making it accessible for everyone to enjoy. Long ago I picked up a spade, not an ordinary spade, but one with a flange along one side. It turned out this was a turf spade for cutting turf of peat. 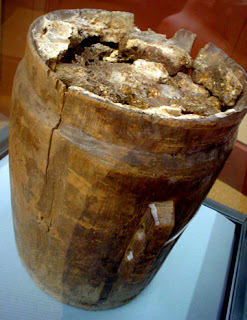 I was told a story about the artifacts discovered in bogs such as butter barrels with butter preserved inside, butter pots and animal skeletons equally well preserved. On a visit to a museum I saw many more artifacts all discovered in bogs. There were brooches, plates, torcs, bracelets, chalices, pots, religious relics and many more. In recent months a manuscript was discovered. It seemed peat was a good preservative. Over the years I developed an interest in these relics. They tell a story of a cultural and social history from hundreds of years ago. These artifacts relate to cultural history in the form of cooking pots, jewelery, skeletons etc. It relates to social history in the way people lived, religious history through reliquaries and manuscripts, and to technological history through axe heads, carved bones and flint implements.